Who doesn’t want their home to be smart and beautiful? 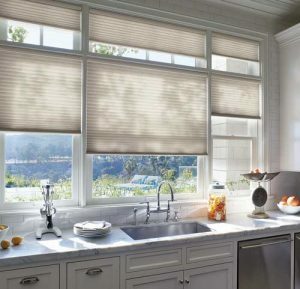 Curtain & Carpet Concepts has Hunter Douglas window treatments in Saratoga Springs NY because they marry style and function to help you create the perfectly-lit home of your dreams. Window treatments are important for so many reasons. They not only add to the style and appeal of your home, but also protect your interior from sun damage, increase energy efficiency, and offer privacy without sacrificing light and comfort. Upstate New York experiences all four seasons in their full glory, including warm, sunny summers and cold, snowy winters. Make the most out of the seasons with window treatments designed specifically for year-round comfort, utility, and beauty. Conceived as a window treatment solution that combines style and function, Hunter Douglas at Curtain & Carpet Concepts are the ideal window treatments for energy efficient homes. Whether you want to gently diffuse light with a sheer or block light with opaque roller shades, our Saratoga Hunter Douglas dealers will help you design the perfect treatments for your home and lifestyle. 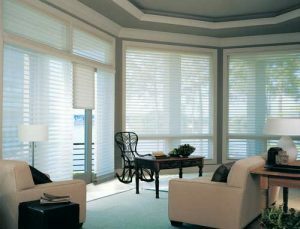 Hunter Douglas window treatments offer two main solutions for controlling light: sheers and shades or shutters and blinds. Choose from a variety of styles, materials, and functionalities to create the perfect blend of privacy, style, and purpose for your personal aesthetic. Consult with our Saratoga Springs Hunter Douglas window treatment design experts in your home or in our showroom!